What matters more, words or actions? Should a company be held to a standard based on their advertisements or their products? What do you do when they contradict each other? I found a great blog the other day because of a link about a series of offensive advertisements. Short, Round, and Fast (www.shortroundandfast.com) is a great running blog written by Nick Bernard. Nick writes about all sorts of topics, but most center around running and his thoughts on training, nutrition, or whatever else inspires him for that particular post. I stumbled on to him and his post about a series of advertisements by Pearl Izumi. The blog can be found here. http://shortroundandfast.com/pearl-izumi-post/#more-1839 A good amount of the ads are shown on Nick’s blog so I won’t repost them here, but this is a pretty good example. I was stunned when I read his blog and the advertisements. This is mostly because the advertisements are elitist and imply that if you aren’t fast you aren’t trying. As a new and overweight runner I often refer to myself as a jogger because I don’t want to imply that I am comparing myself to marathon racers, but I feel like what I am doing is still work. I know I walked in my last Spartan Race, but I finished. That isn’t what really surprised me though. What really was shocking is that Pearl Izumi is a cycling apparel company as well, and they are known for something in that community. They are known to be a good choice for heavy and overweight cyclists. Pearl Izumi has to know about this, even if it is just from internal market research. Pearl Izumi has to know that their extra-large sizes are larger than other brands. When I first started riding I bought Pearl Izumi exclusively as they were the only clothing that I could find that would fit. It carried over to gloves and shoes as well. I am nothing if not a loyal customer that way. Once I find a brand that makes quality goods at an affordable price I tend to shop within that brand. I buy Trek bicycles, Chevrolet trucks, and Wrangler jeans. Looking at the ads, I felt a disconnect between my cycling brand and this projection of the brand’s philosophy on running. The comment thread of Nick’s post was also interesting. There did seem to be a pretty serious schism between runners who thought that some people were not trying and others that respected every runner’s effort. It also came to light that the ads were about seven years old. Some thought that the statute of limitations should be up at that point, others were still vowing to not shop Pearl Izumi anymore. I am still conflicted. I have a background in communications and I first saw the ads as slightly offensive as a struggling runner and obstacle course racer, but mostly that was because I am insecure. I know I am slow, and I know what others might think as they pass me. That’s okay, I try to remind myself that I am doing far better than old me, the guy on the couch. My next thought was that I could see what Pearl Izumi might have been intending. The marketing staff at Pearl Izumi were trying to appeal to the runner’s sense of pride in what they do. Pearl Izumi wanted runners to think “Yes! I am out there deep in my pain cave, giving it my all. I am not doing this to be trendy. I am not doing this as a fad. I am doing this because this is who I am!” I get it, but they missed the mark slightly. Just by a little bit. Even those of us who are slow and jogging feel that same inner war cry as we get ready to run a race. There is something there, so pull we can’t ignore. Something that speaks to us, telling us that we have to try and give this our all. I think that is what Pearl Izumi was going for. They wanted to speak to that part of the runner. Instead they got the other part. There is a culture of mutual respect and support in racing that has surprised me. I have spoken about it before, and it is strong. Every race I attend there are people encouraging each other. Random strangers cheer you on and it’s your job to do the same. In the middle of an obstacle course race people will stop and make sure that the racer behind them has cleared the obstacle. Strangers have helped me over walls, and I have done the same. I have paced a woman with a shirt reading “I want to break 45:00” for a while until another stranger fell inline beside us and took over. She needed to hear friendly voices telling her how close she was and how well she was doing. I have nothing but respect for someone who wears their goal on their sleeve like that. I have nothing but respect for those who willed her on to break that goal. Pearl Izumi accidently spoke to that part of the running community and that part spoke back with indignity. My last thought is that a company with less than one percent of the market share has to take some chances. Nike had a slogan that worked for them. “Just Do It” has been a king maker of an idea. 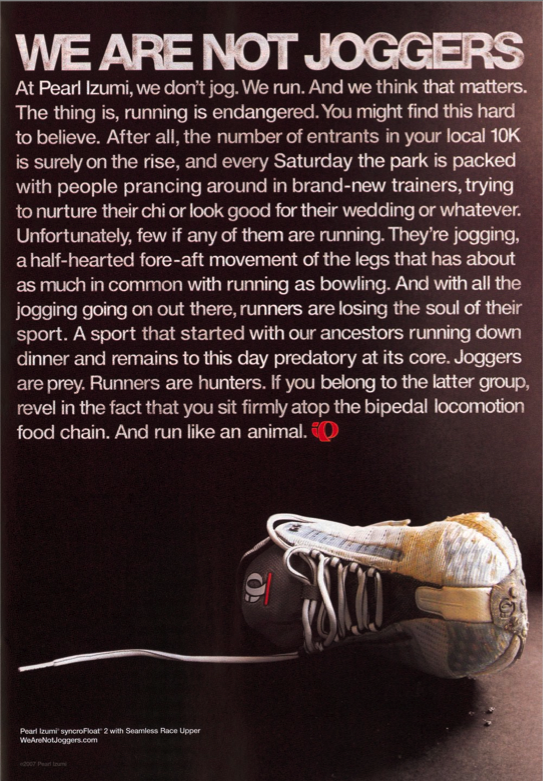 “Run like an animal” was Pearl Izumi’s shot. In some ways it was a failure, they still don’t have much claim on the market, but in others it might have been a slight success. Here it is seven years later and we are still talking about it. Personally it did offend me, but only slightly. I’m a fat cyclist, a fat obstacle course racer, and a fat runner. I am slow, and that is okay. Being offended at a series of advertisements isn’t going to make me any less overweight or faster, trying will. I am faster than I was two months ago, six months ago, and a year ago. That is important. Pearl Izumi may advertise their desire for us all to run like an animal and to not jog, but they also make comfortable clothing for fat cyclists. That’s important too. What do you guys think about their ads? Would they make you shop, or more importantly would they stop you from buying their clothing? I think they need to try harder and be more inventive in their ads. As far as buying their products, knowing; you like them, I might give you a gift certificate for their brand. I’ve never heard of Pearl Izumi. This is probably due to not being a cyclist, nor a runner. (All my exercise is walking, and workout DVD’s: cardio, kickboxing, weight training.) So, just going off of the image of the one ad you’ve included, yes, their marketing is a little offensive; the one above seems to imply that movement doesn’t count if it isn’t balls-to-the-wall. Each day, all you can do is what your body is able to in that moment. Sometimes, that is super intense, Speed Racer running. Other days, depending on what’s been going on in a life, it might be likened to the Tortoise. I think the wording of the ad alienated a lot of people. People that might not ever make a purchase, that if treated kinder, might have at least browsed online. Like you said though, a 7-year-old ad is still being discussed — kept them in the conversation.